(CNN) – Unlike some of his fellow Republicans, Texas Gov. 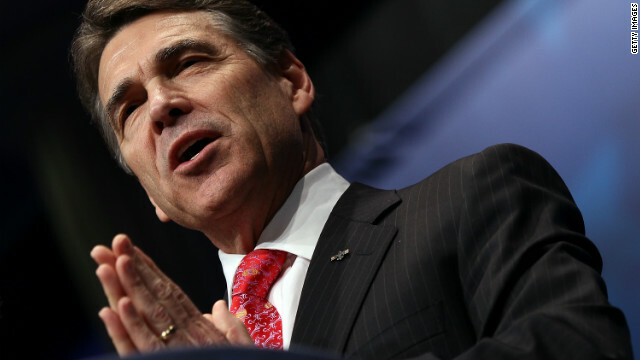 Rick Perry declined to place direct blame on President Barack Obama for the recent influx of children illegally crossing the border from Mexico into the United States. Perry was given multiple opportunities at a congressional hearing Thursday in Texas to fault the Obama administration for what the White House and Republicans are calling a "humanitarian crisis." And while Perry criticized the administration for failing to secure the border in general, he said he was looking for "solutions," not to find fault in the latest series of events involving minors. "I'm tired of pointing fingers and blaming people," he said at the hearing, which was hosted by the House Homeland Security Committee and held near the border in McAllen, Texas. "I hope what we can do is come up with some solutions here." However, he urged the President to send a clear signal that people cannot cross the border without consequence or else there "will be a deluge." Perry, who's considering a second run for president, also called on members of Congress to work with Obama. "The President has bypassed Congress–and maybe he could and should, I don't know, I'm not going to wade in–but this is the one time that I really think the President does need all of you, Democrats and Republicans alike, to be working with you and reaching out," he said. "I hope that all of us will share with the President that we're willing to sit down with him and work with him," he continued. The outgoing governor was also not shy in calling on the President to visit the border and do more to secure the U.S.-Mexico line. And he pushed back against those who argue that the children who crossed the border illegally should be allowed to stay. "Nobody is doing any of these children the slightest favor by delaying a rapid return to their countries of origin," he said. "Allowing them to remain here will only encourage the next group of individuals to undertake this very, very dangerous and life threatening journey." The Obama administration has accused syndicates in Latin America of waging a deliberate campaign of misinformation that has spurred people in poor Central American countries and Mexico to risk their lives to cross the border illegally. While he said he "readily" welcomes the $2 billion in emergency funds for the border that Obama announced earlier this week, the governor asked that Texas be reimbursed for more than $500 million that the state has spent on border security over the past decade. Texas Attorney General Greg Abbott, this year's GOP nominee for governor, told the conservative news outlet Breitbart that he's thinking about suing the federal government to get back money the state has spent on the recent crisis involving children. Authorities estimate 60,000 to 80,000 children without parents will cross the border this year. White House Press Secretary Josh Earnest said Thursday "it's hard to take seriously Governor Perry's concerns" when his Republican colleagues in the U.S. House have failed to pass bipartisan immigration reform like the Senate did last year. "I think the most effective way that Gov. Perry can help, if that's what he wants to do, would be to pick up the phone and call the Republican members of the House of Representatives that represent the state of Texas and tell them to support the bipartisan proposal to reform our immigration system that passed through the Senate," he said. Last month, the Obama administration unveiled a plan to spend almost $100 million in aid to Guatemala, Honduras and El Salvador to help reintegrate the undocumented migrants whom the United States will deport, and to help keep them in their home countries. The administration also will set aside $161.5 million this year for the Central American Regional Security Initiative programs in an effort to "help stem migration flows as well as address the root cause of the migration," the White House said. Obama works with NO ONE! It is HIS demand to be met, and no one else matters. Keep in mind that while Obama blames Congress for this, his announcement in 2011 that unaccompanied minors would not be shipped back opened the flood gates. And he tied his own hands when the Trafficking Victims Protection Reauthorization Act was passed by Congress (Obama, Hillary, Biden, etc) in 2008. This law requires the Border Patrol to take child migrants who aren't from Mexico into custody, screen them, and transfer them to the Office of Refugee Resettlement (a part of the Department of Health and Human Services) rather than send them back to their home countries. So the lefties scream we can't deport illegals in this coutry because it will tear apart families. But they have no problem tearing apart families by keeping all these kids in this country and calling them "refugees" instead of sending them BACK to be with their parents. THEY ARE ILLEGAL IMMIGRANTS, ILLEGAL ALIENS, NOT REFUGEES!!! Well folks, it looks like the leftist Democrats have now found a new way to flood our country with illegals and if you want them deported well then you are just mean, cold-hearted and unAmerican. How many more hundreds of billions is this going to cost us all as they all go on welfare, Obamacare, food stamps, free housing, flood our school systems, hospitals, etc. It is pretty clear to me that the far left extremist Democrat Party is truly out to destroy this country. And make us pay for it as well. Watch out, our dollar is going out of this nation which in turn weaken the economy Imbalance in trade dealings, so only I urge to freeze Immigration for twenty years or so, so that foreigners will not send money overseas. Cut all types of visas if you love USA. Enough invaders in here. Name sky3j, remember the President stated, that border security and illegal immigration is the job of the federal government and not that of the individual states. Maybe you should remember that MEDICAID ONLY gets funded for the first year and after that it drastically decreases every year until the states have to foot the whole bill. Now we send ILLEGALS all over the country, so eventually they can not be found anymore. If you have such a big heart, go and take in some of the illegals, feed them, pay for their education and medical, make sure the rest of taxpayer are not asked to pick up the bills. I work in construction and im a veteran.i didnt serve my country tn have my job taken by an illegal. Nah , King Solomon was a very wise man. No shoe fit here. It's so refreshing to hear a Republican, and especially Perry, say something that makes sense for a change. They are so predictable in their President Obama-bashing that you don't even have to read their posts or listen to the news to know what they are going to say. Perry just went up a little bit in my estimation. Why anyone still defends this excuse for an Administration is beyond me. Kinda like Murphy's Law. Anything that can go wrong will go wrong. Not only has Obama Care killed jobs and severely reduced the Tax Base now we are going to be saddled with 200 thousand more welfare recipients because none will be returned to their own country. People are pissed. That incident in that California town is just the Tip of the Iceberg. Your esteemed leader is passing the buck and ignoring the law everywhere he can. You again will pay the price. Welcome to Re-Visiting the 1930's. The Obama Administration is going to drag it's feet, hoping you will forget this latest snow job. Obama wanted this immigration crisis and did everything in his power to make it happen. As the left says, never let a good crisis go to waste. They don't care about the damage they cause to this country. Obama could stop this "crisis" very easily if he wanted to. Mexico is openly providing the super highway for these people to get here. That is a FACT. THEY NEED TO FEEL THE PAIN OF THEIR ACTIONS. A total shutdown of the border. Nothing goes south, nothing comes north. Ban all airline flights and tourism. This flood of illegals will stop within a week, if not days. Why are we allowing Mexico to do this to us?! !